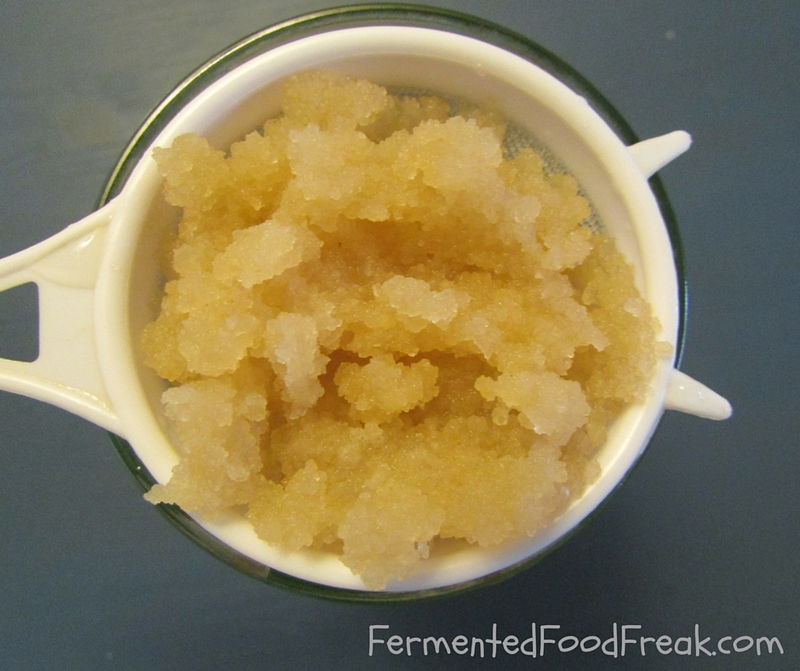 In my last post, I explained what is Water Kefir a.k.a. Tibicos a.k.a. dozens other names. If you read it and got informed about all the wonderful things about it, you are probably dying to make your own Kefir at home. To make Water Kefir you need to have special starter called “grains”. You can easily buy them online or be gifted with by a fermentation freak like me. There are not really grains, but rather crystals like units made of symbiotic colonies of over 400 species of bacteria and yeasts covered in polysaccharide biofilm. If you happen to get grains in the dehydrated form, you will have to wake them up first. To do so, place them in a small amount of sugared water (a glass of water with a tablespoon of sugar for one teaspoon of grains) and wait, stirring occasionally, say every 12-24 hours. They should become bigger and produce a biofilm around them after about three days. If they don’t, change the water and keep waiting. They will eventually come to. When your grains are well hydrated and happy, you can proceed to make your first proper Water Kefir. It’s very easy; just dilute 1-2 spoon of light brown sugar (e.g. demerara) in a cup of non-chlorinated water and add 1-2 teaspoons of grains to it. Cover it with a cloth and stir every 12-24 hours. 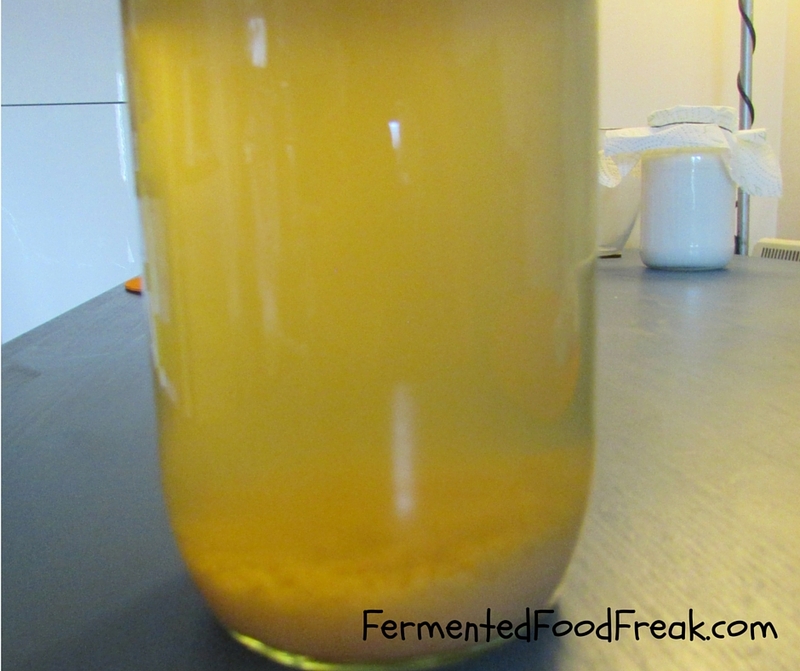 After about 48 hours you will have ready to drink Water Kefir. Strain the grains and put them in sugared water again and repeat the process. After each cycle, your grains should grow a little bit, so you can gradually increase the amount of water and sugar. 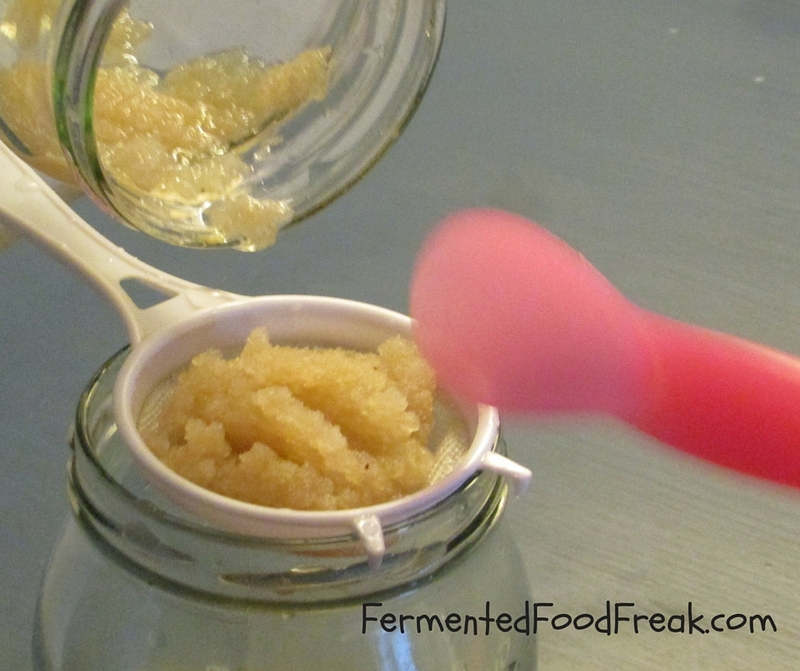 Everything that is left after the straining process is ready Water Kefir. It can be drunk straight away or bottled for secondary fermentation, similarly to Kombucha. It is good to add a bit of fruit or juice at this stage to improve flavour and carbonation. Some people recommend adding fruit to the first stage, i.e. the one with grains. I never do it from fear of changing the grains’ ecosystem, but I am not sure if. Here you can get the best ever Water Kefir flavor guide. Do not touch the grains with metal; use a wooden spoon or a chopstick to stir the Kefir and a plastic strainer or a piece of cloth to strain it. Try not to use chemicals to wash the jars and other equipment. The best water to make kefir is highly mineralized spring water; alternatively, you can use tap water left in an open container for a few hours to remove chlorine; probably the worst kind water to use for Water Kefir is flow-filtered water; it contains chlorine but lacks minerals. If you leave the grains for longer than 72 hours in the same water, they will start to dissolve, due to the lack of sugar. So, if you have no time to feed grains i.e. to make Kefir, put them into the fridge. If you want to store them for a really long time, you have to dehydrate them completely. In this form, they can be frozen and kept indefinitely. Imagine, if this could be done with children or pets! If your grains seem inactive, i.e. they don’t reproduce, the fermentation takes too long and the taste of kefir is very bland, try to mineralise them by using dark sugar or molasses or even adding a few raisins; some online shops sell special mineral liquids. If the grains are slimy, it means they are over-mineralised; use only white sugar for a while. If Kefir smells strange and/or there is a white film on its surface, the grains may be contaminated; rinse them with filtered water, place in a usual sugar solution and put it in fridge for 1-2 weeks to recover. If you want to learn how to make Water Kefir in practice, you are warmly invited to join one of my workshops. Thank you, Peter! Yes, it looks like something complicated, but, in fact, the process is very easy, as you probably know. The same applies for all kinds of ferments. Would you believe that I hadn’t had proper Christmas Eve Borscht for nearly ten years, just because I thought it is very tricky to ferment beets? Previous Previous post: What is Water Kefir?